Alex Fitch talks to Helen McCarthy, author of Hayao Miyazaki: Master of Japanese Animation and The Animé Movie Guide about the work of manga and animé pioneer Osamu Tezuka, whose work is featured in a season of live-action and animated short films and full-length movies at The Barbican centre in London from September 18 to 24. Alex Fitch: The style of Tezuka’s early animated cartoons is very different to his manga – it is very 1960s. Disney cartoons of the time such as The Aristocats and 101 Dalmatians have this flat animation that is very calligraphic with hard outlines and he seems to be responding to that. Helen McCarthy: It’s very much the graphic style of the time. If you look at a wide range of graphics – fabric design, furniture design etc – of the 1960s in general, there is a spirit that runs through it and Tezuka was very much a part of that zeitgeist. AF: Where would his short experimental cartoons have been shown? HM: Most of them were made for festivals or as ‘calling cards’. Obviously, success on the festival circuit is a good thing for an animator because it shows what kind of quality you’re likely to be able to deliver, so Tezuka went on making shorts. I think that if he had made nothing other than his short films he would still have a considerable international reputation as an animator but as time went on, his short films became more of an indulgence and less a part of his career. AF: When did animé become big in Japan? HM: Animé really boomed when TV arrived but it was big in Japan before that. A company called Toei Doga made animated classics – cartoon films for children – that were beautifully made, expensively produced and gorgeously filmed. They made two or three a year and kids would get taken to them at holiday times and it would be a big treat to go to the cinema. It’s the Hayao Miyazaki model of child film-going: Let them see only one a year and make it a good one! But Tezuka looked at how TV was spreading through Japan, and he looked at the cartoons coming from America, from Hanna-Barbera and from the studios at the cheap end of the market. An old friend of his – Shinichi Sakai – said to him: ‘We could do that… We could make Japanese content that’s cheap and fast for TV and then we could sell it back to America!’ Tezuka was wholly in agreement with that idea and so he made Astro Boy specifically with the aim of selling it to America, and did so enormously successfully! AF: How long was the gap between it first being shown in Japan and being translated? HM: Exactly six months. It was screened on New Year’s Day, 1963, in Japan and it hit the American airwaves at the end of June. AF: We think of animé being translated into English for Americans as a fairly recent phenomenon, but presumably there was such an appetite for cartoons in America at that time that they were looking for anything they could show and dub with American voices? HM: Absolutely, and of course animation lends itself beautifully to that, particularly very cheap limited animation because you don’t have to worry so much about lip-synching. Cheap TV animation is a godsend to anyone who wants to dub product. Tezuka was fortunate and so was the American industry in that they had a guy called Fred Ladd who was running a studio that could dub and turn around cartoons very quickly; and Ladd understood what the American audience would or wouldn’t take to… Many people vilified Ladd for the amount of material he hacked out of Astro Boy and other cartoons but you have to remember he was a product of his time. He was working at a time when the mass audience in America was not as sophisticated as it is today and would not have responded well to the original uncut animation. Ladd really had a tough job mediating animé for an earlier American audience and that he did it remarkably well is shown by the fact that people still watch and love Astro Boy and that many, many Americans who had never heard of animé would tell you that it’s their favourite cartoon! AF: Why do you think people didn’t appreciate that these cartoons were coming from Japan – that they just put them in the category of ‘TV animation for kids’? HM: Well, if you saw them dubbed you wouldn’t know where in the world they had been made. Unless you were a real animation buff you wouldn’t particularly pick them out as Japanese films in the same way you might see a dubbed beautiful Polish film with nothing to tell you it’s Polish. Would you be able to tell? HM: It does now, but back then it looked exactly liked American animation because American animation wasn’t that well established, TV hadn’t been going in America that long… When you turned on the TV in America or France or the United Arab Republic and saw animation there in your language, that’s what you thought was American or French or Arab animation – there are an awful lot of people in The Gulf who think that Astro Boy is from their part of the world! AF: What was the balance between animation and manga in Tezuka’s 60s output? HM: He did them both full-time, 24 hours a day! Tezuka was a phenomenal worker, his work rate was quite insane! I did some maths and assuming he started work at age 17 and worked until the day before he died at the age of 60, he had to have produced 10 pages of manga as well as 20 pages of animation script every day! He also had to run his studio, produce his advertising, do all his other interests and somehow find time to see his family… Luckily his studio was right next to his house for most of his life, otherwise his kids wouldn’t have recognised him! 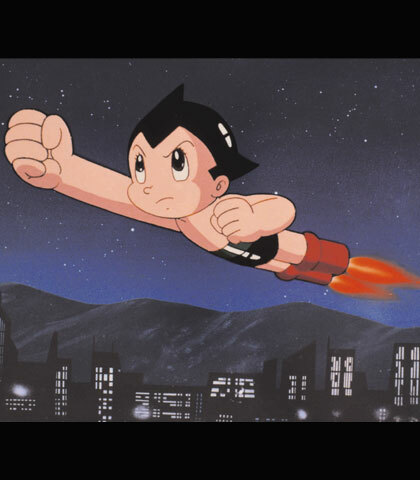 In 1961 alone, Tezuka made $3 million from his manga and he spent it all on making animation! AF: The work that introduced Tezuka to a lot of new audiences – albeit after his death – was the animated adaptation of his book Metropolis / Metoroporisu, which admittedly is more of a remake of the Fritz Lang film done in Tezuka’s style rather than a faithful adaptation of his manga. HM:Yes, the destruction of the city while ‘I can’t stop loving you’ plays over it! It’s not my favourite animé but it’s pretty close! I’ve got a new book out at the moment called 500 Essential Animé Movies (Ilex press). It’s a fun book, because although they made me stick to short series and features – so I had to leave out a lot of long series that I really love – I got to write top 10s and Metropolis is in one of my top 10 lists.